PR firms lust after the kind of buzz that indie developer Petri Purho created in late 2007 with one jerky, poorly lit video of his work in progress, Crayon Physics Deluxe. In the clip, Purho draws shapes on a computer screen, and they instantly take form in a crude 2D landscape. He scrawls an oval that tumbles down a hill. He draws an "L" swinging around a tiny hinge; it acts as a catapult. After a couple million YouTube views, the reaction was unanimous: "Want. Now." In spite of fans' impatience, Purho took a year to develop the game, thankfully without ruining its simple charm. Each of the 70-plus levels occupies just one screen, and the objective seems like Baby's First Video Game: Move the red circle to the yellow star. The question is how to get there. You could draw a pulley system to lug the circle over a burnt-sienna castle. Or maybe you sketch a seesaw under the circle, drop a two-ton trapezoid on the other end, and hope for the best. The titular physics are consistent, though unrealistic. Purho dials back buzz-killers like gravity and friction, resulting in a lazy, dream-like world. Isaac Newton (who makes a cameo) wouldn't approve, but the easy pace encourages tinkering. Unexceptional level design takes a laissez-faire approach, inviting players to make their own discoveries rather than guiding them toward a single solution. 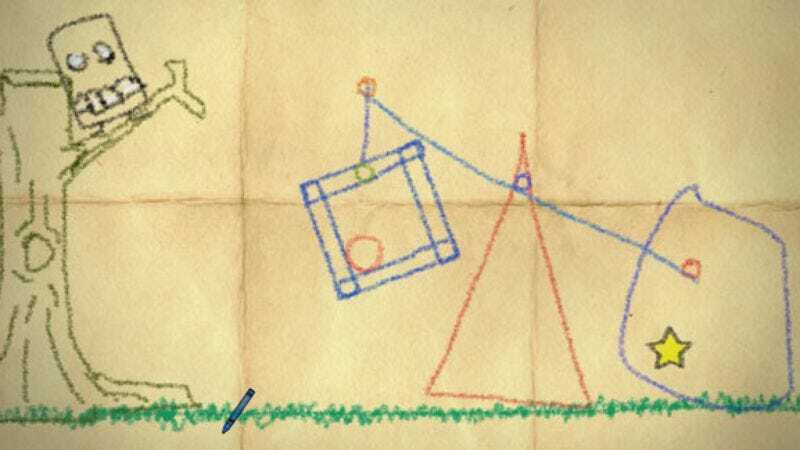 At times, this gives Crayon Physics Deluxe an aimless feel, but that's a fair price to pay for the epiphanies when you realize, "Hey, if you draw the weight over there, and connect the rope like so, there's yet another way to play." Beyond the game: The original proof-of-concept Crayon Physics, which took Purho only a week to program, is still available for free on the Kloonigames website. Worth playing for: The "It's A Car!" level expresses, with game-show-announcer enthusiasm, the joy of drawing a boxy frame on two wheels and watching it drive away. Frustration sets in when: A misplaced click makes your elaborate contraption disappear. This is especially troublesome on the game's playable but awkward iPhone port, available for $5 on iTunes. Final judgment: A work of art worthy of the refrigerator door.